Please be advised that as of Monday January 30th, any student that is seen without an ID and lanyard around their necks will be assigned a detention. There have been a high number of students who have not been doing this lately, and for safety reasons we need to enforce this policy. If a student has lost their ID they can get a new one in the main office. 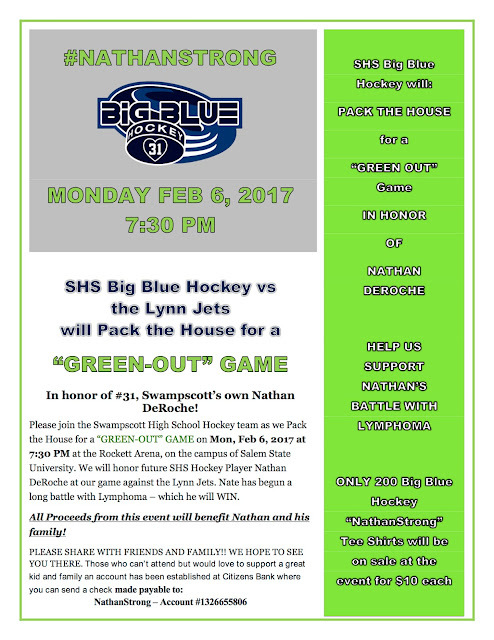 Please see the flyer below for Monday, Feb 6, 2017, a Big Blue Hockey fundraiser in honor of Nathan Deroche, a future Big Blue player who is battling Lymphoma. All proceeds from this game go directly to his family. Thank you for your support. On February 2 the SHS Math Team hosts the final Division 2 math meet of the regular season. Participating teams include Marblehead, Salem, Beverly, Lynn English, and St. John's Prep. The math teams playoff contest has not yet been announced and it will take place on March 2. The SHS Math Team is holding a Pizzeria Uno's "Dough Raiser" at the Vinnin Square Pizzeria Uno's on February 9. "Dough Raiser" tickets will be distributed and available for pickup at Swampscott High School. Bring your ticket when you go to Pizzeria Uno's on February 9. When you pay your bill with your ticket you will help the Math Team earn a percentage of sales for the day. GREEN Scholars is a service learning course that focuses on environmental sustainability. The Green Scholars course is based on the experiential education model that includes community partners. Each student has been challenged to design and implement an environmental sustainable project. The project below is seeking community input to guide the project. Hello, my name is Ellie Wight and I am a senior at the high school. This year I am enrolled in a class called GREEN Scholars in which we are to create a service based project all year with the idea of sustainability in mind. For my project I have chosen to create a small scale bike share proposal for our town. I have created a short survey to get community input. Please help out my project by participating in the survey linked below. The co-op girls hockey team traveled to Falmouth, Maine over the weekend and brought home a 3-0 win. Forward Syd Cresta had 2 goals and an assist. Defenseman Caroline Kinne had an assist in the win, with goalie Sarah Ryan earning the shut out. On Saturday, the team faced off against Bishop Fenwick in an away game and came out with their second win against them this season, 3-1. On Tuesday night, however, they did not fare as well, losing again this season to Beverly 8-1 at the Endicott College rink. The girls have two games this weekend, Saturday at 4:00pm against Oakmont at Cushing Academy, and a Sunday morning home game at 10:30 against Peabody/Lynnfield at Salem State. This will be the first time the girls co-op hockey team will face Peabody/Lynnfield this season. Tuesday's race was postponed, so at the end of this week the Boys JV went 1-1! Boys Indoor Track and Field improved to 5-1 in the NEC with a 64-24 win over Winthrop. The Big Blue were lead by the following 1st place finishers: Jack Dennehy in the 1 Mile (5:05.7), Harry Parker in the 600m (1:42.1), Thomas McDevitt (2:56.2) and Will Fraser (3:00.9) with a 1-2 finish in the 1000m, and Joe Varghese, Jack Leahy and Matt Stephan snatching a clean sweep in the 55m HH. Next week the boys will travel to the Reggie Lewis Center in Boston for the NEC League Meet (Friday 2/3 @ 5:30pm). Anna Cilley High Jump 4'8"
Maisie Vasquez Shot Put 33'5.5"
Qualified for Sectionals in the Girls 200 Medley Relay with a time of 2:11.47 the relay team consisted of Emma Sutherland (Backstroke), Kasey Kennedy (Breastroke), Tessa Diaz (Butterfly) and Chrissy Rogers (Freestyle). Qualified for Sectionals in the Girls 200 Freestyle Relay with a time of 1:58.24 the relay team consisted of Meredith Lutter, Chrissy Rogers, Tessa Diaz and Kasey Kennedy. Rachael Rooklin swam a season and personal best time in the 50 Freestyle with a time of 1:38.84!